NO PLANET and SHIP TEXTURES GEFORCE MX 440 FIX ???? Have Dark Avatar? If so, how do you like it? Galactic Civilizations II: Our Story So Far.. Frequently asked questions with the designer of Galactic Civilizations, Brad Wardell. Q: Can you introduce Galactic Civilizations II to us? Galactic Civilizations is a turn-based sci-fi strategy game set in space in the 23rd century that puts the player in command of an interstellar civilization. The player must explore the galaxy, colonize new worlds, and interact with up to nine major alien civilizations (and dozens of minor ones). Through economic power, technological strength, military might, or diplomatic skill the player must bring the galaxy under their control to win. Q: If you had to bullet point exactly what’s special about Galactic Civilizations II, what would you list as briefly as possible? • 3D engine which allows for a lot more ways to display strategic options (ships, planets, etc.) which gives us the flexibility to provide more depth without over-complicating the game. • Ship Design which lets players create their own ideal starships with their own weapons, visual look, etc. • Planet Colony Design. There’s now a real strategy involved in managing planets. • Resolution Independent. Players aren’t stuck at 1024x768. They can play at virtually any resolution. • Play as any race. They can now play as the Humans, Drengin or any other race in the game or design their own. • New ship combat system. There’s intense strategy involved in what you equip your ships with. • Fleets. Players can now organize their ships into fleets with the game visually including fleet battles. • Unique planets. Each planet is unique. There’s much more than this, of course, but those would be some of the highlights. Q: How many races will GC II feature? There are 10 major civilizations to choose from to play. Plus there are approximately 25 "minor" alien races that players will run into in various circumstances. Q: Please explain the story driven campaign. The game starts out in the year 2225 and the galaxy is on the verge of civil war between the Coalition (led by the Humans) and the Empire (led by the Drengin Empire). As the war heats up, the Drengin Empire discover, and accidentally unleash, an ancient evil into the galaxy – the Dread Lords. The Dread Lords are an ancient race of super beings who had disappeared for thousands of years. Now there is a three-way war. The game also has a very surprise ending for the player. Q: What are the Humans like in Galactic Civilizations II? The Humans are the diplomats but under the surface, they're quite effective at war. As a famous human from Galactic Civilizations I put it, "We've been killing each other for thousands of years, do you really want to join this party?" Humanity in the 23rd century is united, more or less, though players still have to deal with the political issues from time to time. Q: What kind of tech tree will it have? How many technologies will we be able to research? There are roughly 200 different technologies to research ranging from biology to weaponry to communications to computing. A LOT of our effort has been in having technologies that make sense and don't get too much into "Technobabble." The tech-tree in GalCiv II is somewhat different than in other strategy games in that the player is not expected (And indeed shouldn't even try) to research all the technologies. The technology tree allows them different strategic branches to follow to implement in their overall strategy. Q: How many buildings and units are available for creation? Players design their own ships so there's an infinite number of different kinds of units one might build. As for buildings, there's approximately 50 different types of structures players can build in their colonies. Q:Will we have any "Galaxy Wonders" to build? If so please give a few examples. 2) The Galactic Bazarre. This wonder increases that planet's cultural influence by 5X and increases your overall influence by 25%. 3) The Microcombobulator. This wonder will shrink all non-military components down by half giving you more space to load up your ships. Q: What are some random events that occur in the game? 1) A terrorist civilization comes into being and starts carrying out terrorist acts across the galaxy. You have to find who these guys are and conquer their planet. 2) A religious faction is questing to open a dimensional gateway to bring back their "Death god" (a very nasty alien creature from another dimension). The player must find the religious faction's ship before it reaches the place it's going to activate their gateway or else you'll have to deal with the nasty alien creature. 3) A coup has occurred on "alien X"'s home world that is causing the moral alignment of the civilization to switch poles. (Aliens have a setting of behavior between good and evil that determines how they behave.) Such an event can completely alter the way a civilization behaves. 4) A minor race has found a Precursor Artifact that improves their racial abilities by 1% per turn. If left alone, eventually this minor race will conquer the galaxy. You must eliminate them before it's too late. Q: When will the game be released? We are targeting late February 2006. Q: What are the Minimum specs and full specs? Minimum specs would be a GeForce 2 level video card on a Pentium III 1000MHz with 256MB of total RAM. I'd recommend playing it on an ATI 9800 Pro (or equivalent) with 256MB of RAM and a 2 GHz processor. Q: Can you describe the new combat system? In the original game, ships had an attack and defense. When a ship attacked another, each would roll an attack value and a defense value with the difference being subtracted from the ship's hit-points. In the sequel, there are 3 types of weapons: Beam, Missile, and Mass Drivers. And defending against those things are Shields, Point Defense, and Armor. When a beam weapon hits a shield (shields being the optimal defense) then it's the same as the first game. But when a beam weapon hits say, armor (or point defense), then the defense only rolls between 0 and the square root of its value. Q: How does the new system for construction on planets work? Planets have a habitable classification between 0 and 30. The higher the number, the better the planet. In GalCiv II, the planet class also determines how many useable tiles there are on the planet. You have to make some tough choices about what you want to build since you can't possibly construct everything you might want on a given planet. Most habitable planets would fall between class 8 and 12 so anything above that is rare and forces the player to make tough choices. Q: The original Galactic Civilizations could almost be described as Civilization in space – does this sequel have any sign of equality compared to Space Empires 4 and Ascendacy? The sequel has many elements from Master of Orion, SEIV, and Ascendancy. The ship design features are similar to what one might find in MOO except that, thanks to a 3D engine, players can truly make their own ships (i.e., totally control how they look). In Master of Orion, players designed ships but had little control over how they looked. In Galactic Civilizations II, the players are truly designing ships in every aspect. The colonization elements are similar to Ascendancy, and the fleet stuff is probably a bit similar to SEIV except that we don't have tactical battles. Q: What are you doing to make sure the relations between the races (diplomacy etc.) feels natural and believable? Diplomacy was one of the strong points of the first game. However this time, since you can play as any race, it makes things much more complicated. So what we've done is create a series of tools that lets us MUCH more easily add dialog, options, and behaviors on a race-by-race basis so that the options and discussions between races seems natural. Q: What kind of freedom can players expect in terms of designing their own spacecraft, and how important will this element be in the game? We suspect that this will be one of the main highlights of the sequel. Players don't just choose what weapons and engines go on their ships, they can also add wings and add-ons and tails and all kinds of things onto their ships that are purely cosmetic. We basically give players a bunch of "lego" blocks and let them create whatever they want. Q: Will the new 3D engine have any consequences for the gameplay, or only for the visual effects? 1) Players can zoom in and out on the map as they choose. Zoom out far enough and the map turns to a strategic-symbolic mode. 2) We can now more easily have irregularly shaped territories. In GalCiv 1, territory was sector based. Now it's based on the influence of each planet and can be shaped irregularly. 3) The 3D engine is what makes the ship design possible at the level we have it. 4) The 3D engine has much, MUCH better performance than the first game. In Galactic Civilizations I, we had to write our sprite drawing routines in assembly language. It's not often appreciated but Galactic Civilizations I had per-pixel alpha blending despite being a sprite based game. That was very difficult to do on lower end hardware. Now, with 3D, players will find the game a lot faster to play with. In a game that puts the players in command for many hours, the speed of the interface and map are important. Q: As “sequels” go, how much of a sequel is Galactic Civilizations II? Is it really that much of a change? Yes. We didn’t go and take the original and just slap on a 3D engine or something. We took a long hard look at the original Galactic Civilizations and listened to what players and reviewers said. For instance, people wanted to be able to design their own ships; so we put that in. But we didn’t just put in some basic ship design feature – you literally grab pieces and put together your own unique ships. Similarly, people wanted to feel more in touch with the planets, to feel like each planet was truly unique. Q: Why turn-based? The most popular strategy games these days are real-time. Because it’s a viable market that is currently underserved. There are millions of gamers out there who want to sit down and really think out their overall strategy and not feel rushed. Q: The original Galactic Civilizations was a 2D sprite based game, why go 3D? There are a number of usability reasons on top of the basic reason that it looks a lot nicer with a 3D engine. As much as we enjoy having the phrase “dated graphics” put into all our reviews, we thought this time around we would forgo that element of the article hopefully. But the real reason was usability. With a 3D engine, you get to zoom in and out for free without visual degradation. You can change the camera angle as well which lets people play however they want, and it makes it much easier to play the game at any resolution. My laptop does 1440x1080. I want to be able to play the game at its native resolution without it looking scaled. With a 3D engine, Galactic Civilizations II looks “native” at any resolution. Q: Galactic Civilizations I got some attention because you didn’t have any CD copy protection. Aren’t you afraid of piracy? Our primary concern is our customers – the people who pay my salary. They’re my overlord and I don’t want to inconvenience them. Moreover, piracy is really about how many sales are actually lost. What we do is put out free updates after release. We got Editor’s Choice Awards from most of the major game magazines for the original Galactic Civilizations, and that was on the 1.0 version in the box. However, we put out tons of updates after release that greatly enhanced that experience. So let’s say someone got a “warez” copy. If they like the game, they’re going to want the updates, and to do that, they have to have a valid serial number that is verified on the server side (i.e., no cracks). So at that point, we’re going to get that sale or we would have never gotten the sale. I don’t like game companies treating me like a criminal. If I’m paying $50 for a game then I better well be able to put it on my laptop and PC and not have to futz around with keeping track of the CD. Besides, I end up losing my CDs anyway. Q: Tell us a little bit about TotalGaming.net. What exactly is it and how does it relate to Galactic Civilizations II? Sure. To steal an analogy I saw online, it’s like iTunes for games. Except you can redownload our games at any time. Let’s say you lose your GalCiv CD. No problem, you can download the whole game from us as long as you have a valid serial number. Plus after you’ve registered once with us, you can lose your serial number too because we can resend it to you forever after. So even five years from now, you can get a new PC, put in your serial number (or have it emailed to you automatically if you’ve lost that) and install the latest/greatest version of our games. TotalGaming.net refers to our overall gaming network. You can buy our games individually at the store directly, or you can just pay $69.95 and get 10 tokens that you can use to get specific games at a steep discount. So even years from now, TotalGaming members may have their tokens that they can use to get a new game instead of getting titles they may not want. The biggest advantage of TotalGaming.net is that there’s no hassle. There’s no digital rights management (DRM) or anything like that. You install the game on as many of your own computers as you want. We do keep track to make sure it’s not being installed from say California and New York at the same time, but if you want to put our games on your PC and laptop, knock yourself out. Q: Will Galactic Civilizations II have multiplayer? Not in the retail release. However, we are writing it in such a way that we’ll be able to add multiplayer in later if there's demand. Turn-based games and multiplayer have not always mixed well because of the time involved to play and I've yet to see a multiplayer game that didn't significantly sacrifice single player play in terms of good computer players. The other issue is outside game design and into retail marketing -- games like Civilization IV and Master of Orion 3 shipped with $49.95 or above price tags, we wanted to go with a $39.95 retail price point so that players not interested in multiplayer weren't forced to subsidize it. Everyone knows I love multiplayer and most of our PC games have had multiplayer in them. The fact is, though, that most people don’t play multiplayer and I don’t want to divert resources into that. So what we’ll probably do is have an expansion pack that adds multiplayer. The people who want multiplayer can thus buy that feature and those that don’t aren’t forced to have to pay for it. We do, however, have the Metaverse which has been very popular with Galactic Civilizations I players. Q: Explain what the Metaverse is. The Metaverse in Galactic Civilizations II is a specific way of playing the game. No mods, no tweaks – you’re playing specific scenarios downloaded from Stardock.net. 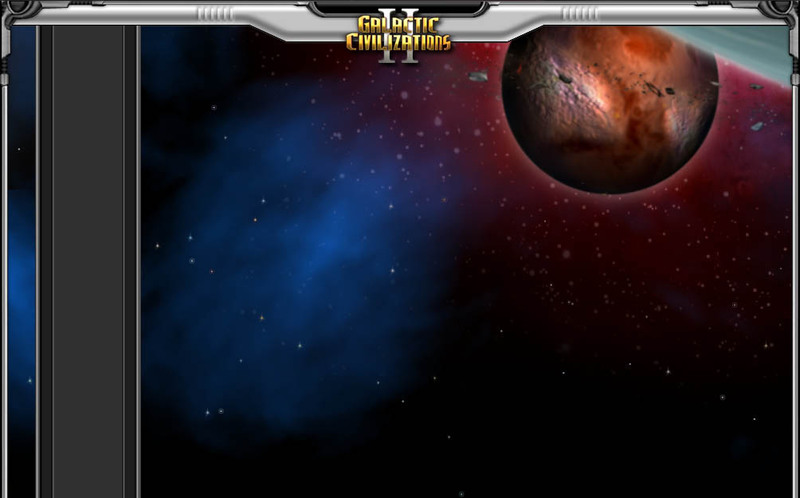 Players then score points in these scenarios and the results are submitted to Stardock.net, thus allowing gamers to accumulate points in a persistent virtual galaxy. Players can also band together to form empires and actually see their empire on a map of the galaxy. Their individual games are logged and they’ll be able to (in Galactic Civilizations II) see how their game progressed and compare their results with thousands of other players. The Metaverse was a huge hit in Galactic Civilizations I, much bigger than we had anticipated. It also lets us look and see what weaknesses we have in the computer AI and see what we can do to improve it. Q: On a single player game, the AI needs to be tough, how do you plan to go about that? Tough AI isn’t the key. AI that plays intelligently is the challenge. It will be easier to have intelligent AI in Galactic Civilizations II because there’s a lot more choices for players to make. For example, battles in GalCiv II are different than in GalCiv I. In GalCiv I, we had the usual “ship has attack of 5, defense of 3” type thing. In GalCiv II, each ship will have three types of attacks and three types of defenses (on the attack side, they’ll have beam weapons, missile weapons, and mass drivers and on the defense side they’ll have shields, point defense and armor). Good players will be able to plan out their research strategy to make sure they have the right weapons and defenses to take on the right player. But humans will have a hard time out-computing the AI in this field. It’ll be able to do a lot more analysis to optimize its fleets. The same is true on planets. We’ll have the advantage of having played the game for so many months before release that we’ll have a feel of how to structure one’s empire of planets. The right balance of research, economics, and industry across an empire and then put that into the AI. Since the AI will have these native advantages, one change we’re making from the first GalCiv is that the AI did have one big unfair advantage (actually two): it could see all the good planets and had a much bigger sensor range than the Humans did. The new 3D engine lets us get a lot of fog of war stuff easier, so this time the AI will be on a much more even footing with the player.